Automatic Sleeve Labeling Machine---The sleeve labeling machine was used for cutting and sleeving the label onto bottle body and shrink it with by steam. We have bottle neck sleeve labeling machine, and bottle cap sleeve labeling machine. 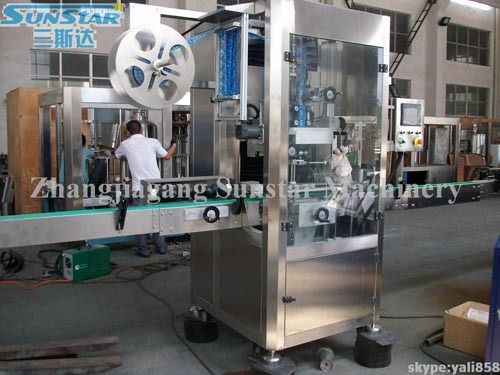 Or bottle body and neck double head sleeve labeling machine. The whole process is automatic. All-cover type stainless steel host machine: the whole machine is waterproof as well as rustless. Bottom set of label brush:a more precision for casting label. Label-controlling electric-eye shelf:unique combination of tail and electric-eye to improve the precision for cutting off The membrane materials. It adopts PLC programmable controller,imported servo motor,servo driver,frequency converter and transducer; besides,it dopts The positioning module to ensure the casting label precise, rapid and stable.